Stade Francais prop David Attoub was the surprise inclusion in France coach Philippe Saint-Andre's 23-man squad for their Six Nations opener against Italy. Attoub, who famously served a 52-week ban in 2010 after being found guilty of eye-gouging Ulster's Stephen Ferris in a Heineken Cup clash, is set to grace the international stage for the first time since his one and only cap five and a half years ago, despite not being included in Saint-Andre's original 30-man squad. 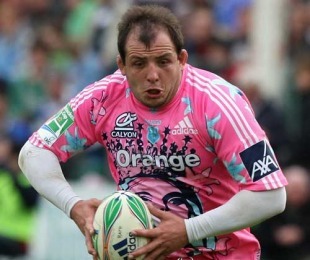 As a result, Rugby World Cup prop Fabien Barcella fails to make the cut as does Castres prop Luc Ducalcon. "He [Ducalcon] has only played 25 minutes with his club," explained Saint-Andre. "We wanted to include Attoub, who is a regular starter with Stade Francais as a tight-head prop. And we know the Italians' scrum is very good." The squad, that will entertain the Azzurri at the Stade de France on February 4, also includes uncapped Clermont Auvergne centre Wesley Fofana, who is tipped to form a midfield partnership with club-mate Aurelien Rougerie, and the similarly inexperienced Toulouse lock Yoann Maestri. Former skipper Lionel Nallet, who was recalled as an injury replacement after failing to make the initial squad, is also set to feature with Julien Pierre, Fulgence Ouedraogo, Yannick Nyanga, Yann David, Alexis Palisson and Clement Poitrenaud that other players cut from the original squad. Forwards: David Attoub (Stade Français), Vincent Debaty (Clermont ), Nicolas Mas (Perpignan), Jean-Baptiste Poux (Toulouse),William Servat (Toulouse), Dimitri Szarzewski (Stade Français), Yoan Maestri (Toulouse), Lionel Nallet (Racing Metro), Pascal Pape (Stade Français), Julien Bonnaire (Clermont ), Thierry Dusautoir (Toulouse) (Captain), Imanol Harinordoquy, (Biarritz), Louis Picamoles (Toulouse). Backs: Morgan Parra (Clermont ), Dimitri Yachvili (Biarritz), Lionel Beauxis (Toulouse), François Trinh-duc (Montpellier), Vincent Clerc (Toulouse), Wesley Fofana (Clermont ), Julien Malzieu (Clermont ), Maxime Medard (Toulouse), Maxime Mermoz (Perpignan), Aurélien Rougerie (Clermont ).